They call him the “Chairman” but there’s never been a boss like Zak Bagans on reality television before. Clad in all black, military-esque fatigues, he nearly blends into the cavelike surroundings. Like a hybrid of Batman and Captain Kirk, Bagans possesses an intense sense of calm, standing with hands clasped behind his back as he peer at the nerve center, the setup of scaffolding and audio/visual equipment. Occasionally he looks over the heads of his “Chief Judge” and celebrity guest judges at a bank of monitors and calls out directions to “listen in” to the onscreen figures, illuminated only in nightvision. Zak Bagans is a true believer of ghosts, and this is his world of Paranormal Challenge, a new reality series premiering tonight, 9 p.m. ET, on Travel Channel which merges the popular paranormal investigation programs with competition shows. Serving as executive producer and star – similar to the double duty he performs on Travel’s Ghost Adventures - Challenge pits two ghost hunting teams against one another for bragging rights at some of the nation’s allegedly “most haunted” locations. For the 34-year-old former DJ, ghost hunting is a way for the living to find answers about the afterlife, but also “allows the dead to find their answers” through communication. His pursuit garnered him millions of fans since he co-created the Ghost Adventures documentary with Nick Groff in 2004 (where he appeared to catch on film a brick lifted and hurled at him by an unseen force), which aired on the erstwhile Sci-Fi Channel (now Syfy) in 2007 before Travel Channel picked up the show about a year later. Now, although Bagans is a leader in a crowded field of TV investigators, he insists he doesn’t have a monopoly on the paranormal community. “Just because I'm on television - or other people are on television - doesn't mean that this is our community and that we lead it; this is something that belongs to the world,” says Bagans - hence his idea for Challenge. 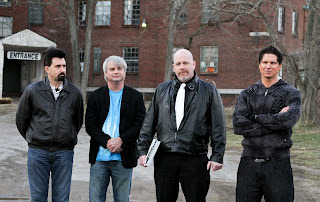 Not only is the show a unique evolution in the paranormal-TV genre, what makes the new program especially notable is that Bagans hopes to share his fame with regional investigation teams who often pursue evidence of the afterlife but may not have a venue to show off their work – and lack access to these well-known haunted hotspots. While Bagans emphasizes that Challenge is a small way to give back to fans and give props to other spook seeking organizations, he acknowledges it is still a competition show, which means there has to be judging criteria to determine a winning team. Plus Bagans points out that winning the challenge doesn’t mean “big cash prizes.” He says he tells all of his teams it’s all about having fun, and taking part in a shared goal to “find answers.” That’s why he says the victors only get bragging rights. Even with the categories the teams are analyzed on, he says he can’t claim to tell a group that there are right and wrong ways to investigate. Besides, he adds, he already respects and appreciates every team who shows up to pursue the unknown. Along for the ghost ride with Bagans is “Chief Judge” Dave Schrader – the host of the Darkness On The Edge of Town Internet radio show and paranormal tourism event organizer – as well as a rotating stable of notable figures within the paranormal community, including authors, journalists, historians, psychics, inventors and personalities from other reality shows. As established in the premiere episode at Rolling Hills Asylum in East Bethany, N.Y., and followed by an investigation at Philadelphia’s Eastern State Penitentiary, Bagans and his judges monitor the competing teams live through a system of robotic and static cameras, as well as one cameraman per group. Compared to the small Ghost Adventures investigative crew of Bagans, Groff and Aaron Goodwin, who get “locked down” alone in haunted locales, Paranormal Challenge is a larger production. But Bagans says it is necessary to avoid an illusion that competing teams were alone in a building. In addition to a larger scale, another difference between Adventures and Challenge is that Bagans isn’t in the midst of the action. He says he’s used to the excitement of investigating but relishes hanging back as the Challenge Chairman where he oversees the judges and observes the teams in action. But, he adds, he does occasionally have the temptation to join the investigation with the groups. Statements like this perhaps reveal how much of a big kid Bagans really is. Though a serious enthusiast of the supernatural, and despite his reputation as the guy on TV who runs down dark halls shouting at demons, Bagans isn’t afraid to have fun and goof on himself. He’s lampooned his persona - and host Joel McHale’s - on E! Entertainment Television’s The Soup. He also thinks the paranormal community would benefit from relaxing a little, and dismisses critics who claim a competition show will compromise the credibility of paranormal investigations. In fact, Bagans says anyone can and should research the paranormal and ignore haters who try to claim it or dictate how it must be done. And though he says he’s been dealing with his own paranormal challenge of executive producing and appearing on two shows - as well as working on his September 2011 biography Dark World: Into the Shadows of the Lead Investigator of the Ghost Adventures Crew and being a main attraction at paranormal conventions - Zak Bagans can’t think of a better way to live.